I was on the lookout for a cast iron guide sign for years before I finally found one that had been saved from the scrap heap. The sign only measures 18″ x 24″, but weighs a hefty 57 pounds. 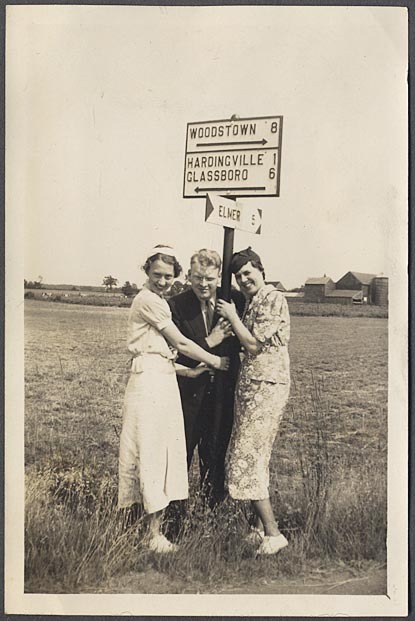 My best guess is that it was posted in New Providence Township, Union County (present-day Berkeley Heights), where Glenside Avenue and Glenside Road used to meet at a fork before the construction of I-78. This is by the entrance to the Deserted Village in the Watchung Reservation. 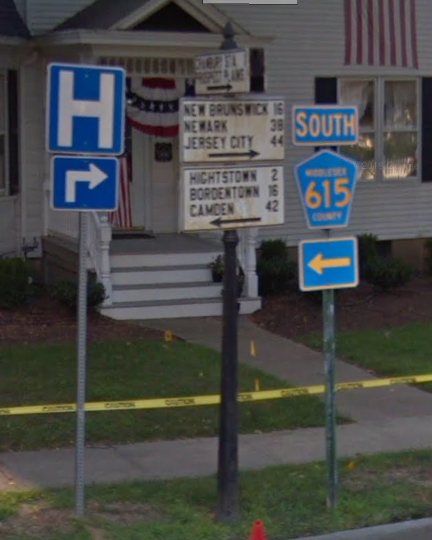 Guide signs like this were still around in decent numbers when I was a kid, but only a handful are left in the state today (e.g., Cranbury in Middlesex County still maintains a few of them). You can still spot quite a few of the original posts hanging around, if you look hard enough. The photo carousel above documents the stages of preparation and painting from the sign’s “lead paint chip dispenser” stage (sic, Ed Tapanes) to the finished product. I initially used a wire brush, then applied Soy Gel stripper and removed loose paint with a scraper and awl. I sprayed the white coats then used a sponge brush for the raised lettering. I elected not to sand blast the sign to avoid any possible blunting of the edges of the letters. From the 1927 State Highway specification, this 16″ round aluminum NJ State Highway 27 shield came to me in really nice condition, with no need for restoration. 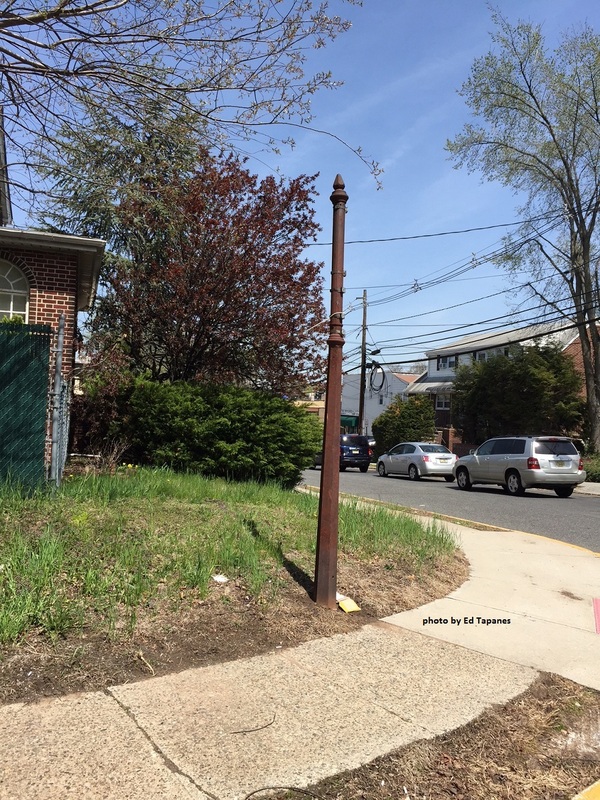 Route 27 used to extend from Newark to Trenton, but its southern terminus is now in Princeton. Like the cast iron guide sign I have, these early NJ State Highway shields seem to be scarce as hens’ teeth. Probably manufactured in the 1910s or ’20s, this sign from the corner of Eleanor Roosevelt’s Greenwich Village apartment does not have its original frame, though it is in a period correct one, from Easton, PA. I think these cobalt blue signs look very graceful in their dull frames, and I love the font, especially the way the points of the “W” and “N” extend ever so slightly below the base line. In my book, New York has one of the cooler-looking state highway shields, and I’m delighted to have an example in my collection. This particular shield, dated June 1957, comes from the last generation of cut-out NY shields; made in between the embossed shield era and the modern, rectangular shield era. NY Route 439 formerly extended from the Goethals Bridge across Staten Island via Forest Avenue to the Staten Island Ferry, and continued in Brooklyn a short distance to the Belt Parkway. It was discontinued in 1968, soon after the Verrazano Bridge was constructed, when ferry routes between Staten Island and Brooklyn were terminated and most cross-island traffic flowed to the bridge via the Staten Island Expressway. Porcelain on embossed steel, circa 1950. Hunterdon County Route 512 is still a very scenic drive today. I love these early embossed county route shields, and I’d really like to find a Passaic County example someday. Once ubiquitous around the state, these 1940s (?) bus station markers with their cool graphics are a New Jersey icon. I remember one of these was posted around the corner from our house at least into the 1980s. The GSP shield that I owned at one time came with writing on the back dated 1962. I did not know this writing was even there until I actually had the shield in hand. It is an interesting bit of historical context. Welcome to Clifton (NJ) shield that I believe was posted a mile from the house I grew up in. Thanks, Ed Tapanes! Stop When Flashing sign: I’m not sure where I got this. It appears to have been part of a railroad crossing or entrance gate. NJ Route 28 Shield (24″ x 24″): I snagged this from my neighbor’s trash several years back. According to sign expert Steve Alpert, this sign can be likely dated to the 1980s by the NJDT printed in the lower right corner.